Phone company Verizon (s vz)(s vod) quietly launched its smart home products nationwide about three months ago, which enable customers to lock and unlock doors and windows, watch home video cameras remotely, and manage thermostats and lighting. This is the service Verizon launched in trials in New Jersey about a year ago. Verizon discovered a few things about the service in the months it has been widely available, as well as via the months it was been available as a pilot service. First, Verizon Director of Product Development, Home Monitoring and Control Ann Shaub said Verizon’s standalone energy products haven’t been as attractive as the whole smart home package that includes cameras, door sensors, and door locks. That’s not so surprising, as security and media management are clearly a lot more attractive to customers across the board compared to products used for reducing home energy consumption. Verizon also says it doesn’t make claims about saving energy for its home energy products, so it’s not actively marketing them as energy efficiency tools. Verizon is currently working with Ingersoll Rand (s ir) for its security products, and Aeon Labs for its thermostats and energy reader, which attaches to a circuit breaker and appliance switches. Shaub also told me Verizon is actively looking to add more smart home tools over the coming months. Verizon says it has seen 95 percent of its smart home customers install their own devices. That could be a good sign for Nest, the smart learning thermostat startup, which is selling thermostats straight to consumers. Verizon wouldn’t give me any information about the numbers it’s getting for its smart home tools at this point. Shaub would only say the division is here to stay, and it’s seeing significant growth. 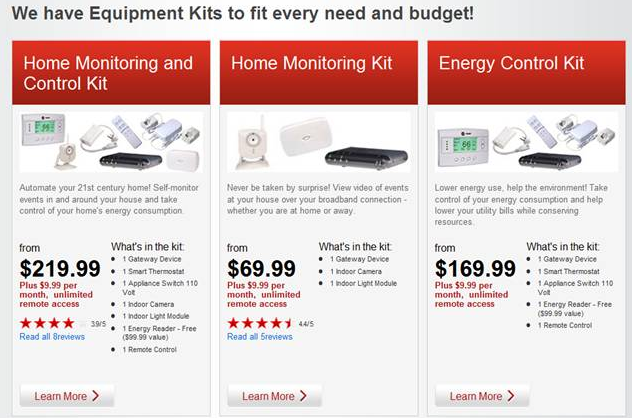 What intrigues me most here, is the question why people would want Home Energy Management. All adds I see have the focus on cost reduction and control, sometimes mentioning comfort levels as well. What Verizon does, is sell HEM als part of a more attractive system. Any opinions whether that is the way to go? Also: anyone aware of other innovative ways to get people interested in HEM? I heard of the social networking and competition factor. Any experiments on schools asking kids to run the HEM yet? @carib websites, haha, I hope one day soon! Soon we will be able to flush the toilet while making toast….all from our iPhones!! Added to our directory of home energy management systems, the 14th entry. I wonder when we start to think that this market is getting crowded? And this does not include the list of smart thermostats, like Nest as you mention, one of 9 in that category. But it is good news for us who are hoping to see consumers get the message that it is time to do something about their energy footprint. All news is the chance for another rate payer who might get this! I have that on my Volt using the OnStar app.